(2) the determining role of these identity and travel documents in saving and protecting the relocated refugees and the stateless persons against oppression and degrading conditions. Some great personalities of the world have benefited from the possession of a Nansen passport enabling them to save themselves and freely travel to countries which have accepted them as they would their own nationals: i.e., Igor Strutinsky, Anna Pavlova, Mark Chagal, Serghei Rahmaninov and many others. Unfortunately, our contemporaries have forgotten about them and the benefiting role played by these passports during the first half of the 20th century was lost in time, while their owners disappeared into history. The surviving documents remain only simple curiosities kept in the showcases of museums or archives, or in the personal collections. And yet these identity and travel documents, for those without country and nationality / citizenship have been reborn being also very much present our days, though lacking the “savior” value of their predecessors due to the fact that the actual international community can fastly intervene in different world conflicts which usually generates lots of refugees. The present globalization and the international migration phenomenon have changed the vision and legal intervention instruments regarding these categories of persons and gave a new look and significance to the “past diligences” named travel certificates for the refugees. The reality of modern manufacturing techniques brought these kinds of inscriptions closer to the national passports physiognomy, from the form and content point of view; thus the differences are relevant only in the field of formalities pertaining to the control of foreigners established on the national territory of states. The importance and actuality of this book are constrained by the knowledge of the evolution motives and materialization forms of the migration phenomenon from a historical perspective, as well as by the role and importance of travel documents for the potential victims of extermination and persecution. At the present time, the international community faces increased migration of individuals and/or ethnical and religious groups over the visible or invisible borders of states, legal or fraudulent, controlled or clandestine, having, in many cases, unpredictable consequences which become increasingly more difficult to measure. Based on the conception process and on the method of presenting these travel documents, this book may represent also a useful instrument for researchers and collectors. During the research, documentation and elaboration activities, diverse bibliographic, legal and public sources were used, although this book might not have completely succeeded in covering all aspects and subtleties related to such travel documents and passports. For the illustration of the present book, a key role was played by the various types, models and specimens of identity and travel documents owned by the author in his personal collection along with others provided by different collectors. Being proficient in the knowledge and study of these travel documents, and due to constant and hard acquisition efforts made over the time, the author succeeded in creating a consistent and comprehensive collection of passports, travel documents, identity certificates, visas, consular stamps and other related documents. Being aware of the fact that the content of this monograph presents all the models of the so-called “Nansen passport” circulated in the 54 countries which signed, ratified or adhered to the Conventions and resolutions which have decided to impose this kind of document. Other countries issued many similar types of travel documents for refugees, relocated or stateless persons, for limited validity periods, having different formats, graphic designs and colors. The content of this work is organized and structured into five chapters in accordance with the types of identity and travel documents issued for refugees and stateless persons. Chapter I, presents the nansen report and the chronological order of all actions initiated by the League of nations for political regulation of this travel document, (so necessary and useful for the Russian refugees of that time and, later, for the Armenian expatriates). The compliance of the signatory states’ authorities of the Convention for refugees to the conception, layout and editing techniques of the unique model, determined the printing of a unanimously recognized representative format. The Nansen stamps applied on the certificates issued to persons under the competency of these international rules are also presented and described. Chapter II presents the context and phases of the appearance of the travel document issued based on the Convention of 15th October 1946, in London. 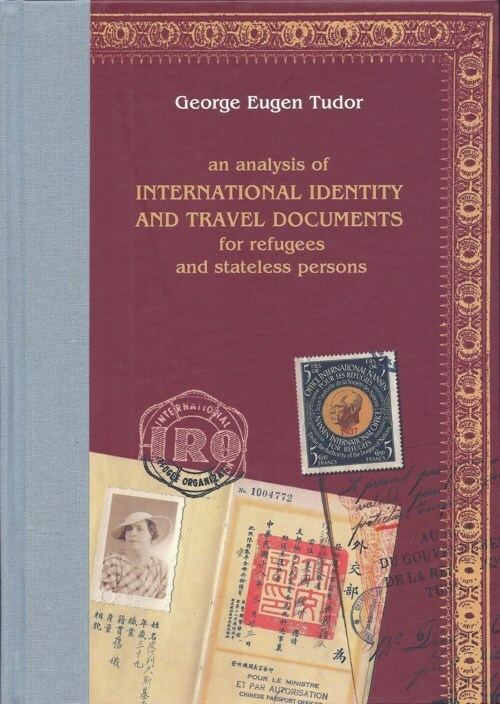 The identity and travel document issued for the refugees according to the Convention of 28th July 1951 is presented in detail in Chapter III together with some of the most important stipulations which at the time oriented the legal status of this category of persons, from the perspective of the internal law of each state and of the international law norms. These travel documents are used nowadays by a large category of refugees still being temporary outside their origin territory because of persecution or physical or psychological constraints. A few stipulations of the European Agreement no. 107 of 16th October 1980, regarding the responsibility transfer pertaining to the refugees, adopted in Strasbourg, are also presented. In the final part of this chapter, references to the regime of refugees` journeys over borders are made in accordance with the European Agreement no. 31 of 20th April 1959 regarding visa elimination. Chapter IV of the book gathers appreciations and considerations concerning the identity and travel certificate issued for the persons without citizenship. Statelessness, as an anomaly condition within international law, has found a rule and, through the elimination of which, different alternatives accepted by the signatory states of the Convention of 28th September 1954 were established. The travel document issued in compliance with this international rule has many common elements of form and content with the one of which benefits the refugees. Chapter V is dedicated to the travel documents issued to the Palestinian refugees according to the Protocol of 11th September 1965, of Casablanca. This chapter presents, in an abbreviated manner, aspects related to the problem of the Palestinian state; of the original refugees from that zone; and migrants to neighboring and friendly countries, as well as a few internal rules of the countries issuing these kinds of papers: Egypt, Lebanon, Libya etc. A synopsis explaining the Dr. Nansen identity and travel certificate – characteristics and elements of individualization; a further synopsis of formal characteristics of travel documents issued based on the Convention for refugees of 28th July 1951 and a gallery of identity and travel documents for refugees, stateless persons and foreigners issued by national entities and not according to the League of Nations Dr. Nansen’s resolution of 1922, 1924, 1926, 1928 and 1930 or on behalf of International Refugee Organization (IRO) Agreements of 1946, 1951 or on behalf of UN Convention of 1954.